Voyager - I want to be on board! 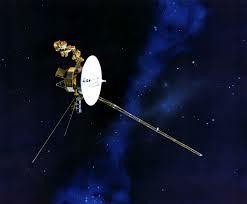 This week I watched an incredible documentary called, "The Farthest - Voyager in Space." The PBS show does an amazing job of showing us the people, the science, and the story of the NASA Voyager spacecrafts. My family and I were so blown-away by all of the things we just didn't know about our solar system, that we we were compelled to discuss the documentary and even went on the internet to learn more about what we experienced. A few days later, I started to think about what it was about Voyager that was so compelling. I realized that if I could make my customers feel so compelled, I would have lightning in a bottle. Coincidentally, the name of the spacecraft, Voyager, describes the secret behind everything - the voyage of the mission itself. It was the planning, the collaboration of scientists and organizations, the goals of each part of the mission, the passion of the people behind Voyager, the visual way the story was told, and the milestones along the way. As human beings, we love to be part of something significant. We want to hear about the voyage and be drawn into being a part of it. People are much more engaged when you describe journeys that share some of the components I've mentioned above about the documentary of Voyager. One of the ways to see this in action in a sales situation, is to convert your messaging to the customer in terms of a voyage. If you look deep enough into the products/services that you sell, you'll find that customers are NOT really buying the "thing" you are selling. They are buying the IMPACT they believe their company will have after the purchase. You can take this OUTCOME, and make that the end of the voyage. This way, the buying process becomes the journey that you can take your customer on. Many times, you'll find out that your customer has no idea how they'll get from where they are today, to what they really want their organization to be like. Describing the steps/milestones along the journey, and helping them to define the voyage (road-map), is part of providing value to your customer. After some commitment from both parties, you'll find that you're both on the voyage together. Both parties benefit from such a voyage. Today, figure out how you will change your "sales pitch" into a journey.